GCU men’s basketball coach Dan Majerle and players pose for photos and discuss their lofty expectations for the 2016-17 season during Wednesday’s annual Media Day at GCU Arena. 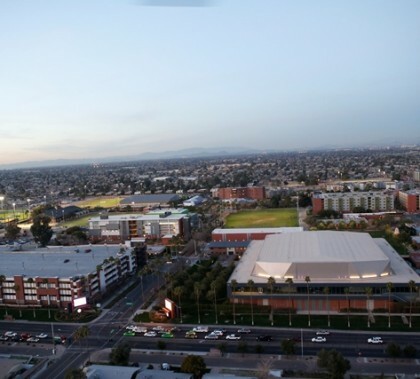 Officials at Grand Canyon University announced Wednesday they have appointed an independent committee to explore strategic alternatives to its investment-based business model, including a return to nonprofit status. Grand Canyon University has been chosen as a finalist for the Greater Phoenix Chamber of Commerce’s 26th annual Impact Awards. Photos from the Northfield, Mass., campus founded by evangelist D.L. Moody in the 19th century and the news conference hosted by owners of the Hobby Lobby retail chain. Details regarding the announcement from Northfield, Mass., that an arm of the GCU Foundation will receive the gift of a historic, 217-acre campus in the Northeast. The Northfield property was founded in 1879 by evangelist D.L. Moody as a seminary but has been unoccupied since 2005. It was purchased three years ago by the owners of the Hobby Lobby retail chain, who have since spent millions of dollars in renovations. Emergency text-messages could prevent serious calamities on campus by directing students and staff around danger, simply by sending alerts to the palms of their hands. GCU’s new Rave Mobile Safety alert system is up and running now. And emergency alerts are just part of the technology’s potential. GCU’s new Grand Canyon University emergency text message system goes live, giving students, faculty and staff the ability to receive emergency texts in the palm of their hands. The system provided by Rave Mobile Safety also gives users the chance at receiving GCU news and other events related messages on a regular basis. City leaders heralded the GCU Neighborhood Safety Initiative unveiled Thursday as a program to be duplicated citywide. How to reserve bowling lanes and game room equipment in Thunder Alley. Hours are 2 p.m. to 10 p.m. Sunday through Thursday, and 2 p.m. to midnight Friday and Saturday. There are 6 lanes, 3 pool tables, 2 ping pong tables, A Golden Tee arcade game, air hockey table, and more.